Are you using the Best SEO Friendly Permalink Structure in WordPress? Did you know that Permalink Structure is the one key factor for Search Engine Optimisation? Which is the Best WordPress Permalink Structure for SEO you know about? and How to change permalinks in WordPress without breaking links? This post is all about WordPress Permalink Structure, Which Permalink Structure you should use for Search Engine Optimisation and How you can setup the Best SEO Friendly Permalink Structure in WordPress. I’ll also discuss the pros and cons if you have a running blog and wanted to shift from older permalink structure to the Best WordPress Permalink Structure for SEO. And how you should do it properly, without losing your Search Engine Ranking. One shouldn’t change permalink structure on the weekly or monthly basis. So what is the right time, we’ll also have a discussion about the same. Okay! Now, before diving deep into the sea of WordPress for SEO Friendly Permalink Structure. Let’s begin with the basics, First, let us discuss What is a Permalink Structure in WordPress and how does it look like by default? A unique and permanent URL (Uniform Resource Locator) of your blog post or your website page is known as Permalinks. These URLs or Permalinks used as a web address of a particular web page. Permalinks are the permanent URLs to your individual weblog posts, as well as categories and other lists of weblog postings. A permalink is what another web blogger will use to link to your article (or section), or how you might send a link to your story in an e-mail message. The URL to each post should be permanent, and never change — hence permalink. This Permalink Structure in WordPress comes by default and it is not an SEO friendly permalink structure at all. This is not even a user-friendly URL Structure as well. WordPress offers Six different type of permalink structure for your blog, including a custom permalink structure setting. You can change a default Permalink Structure from available options in WordPress Dashboard > Settings > Permalinks, as shown in the below picture. Great! by far we have learned about the WordPress Permalinks Structure and available options. So, which one do you think is the Best SEO Friendly Permalink Structure in WordPress and Why you should use that? Before that, Let’s discuss why it is important. There is no need to discuss the importance of Search Engine Optimisation (SEO), as you might have aware that more than 70% traffic on any popular blog or website derives from Search Engines like Google, Bing, and Yahoo etc. 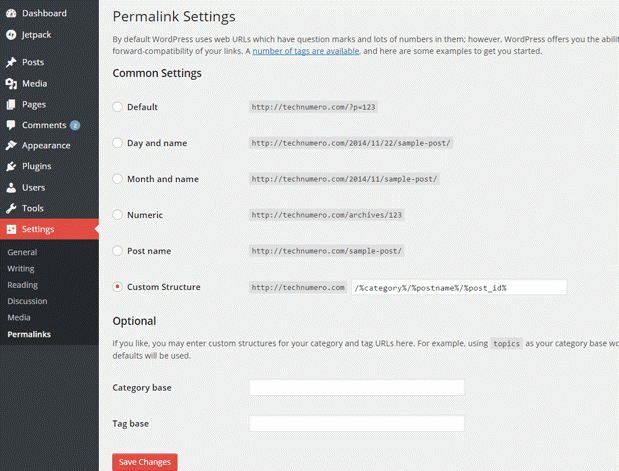 Whenever I talk about SEO friendly settings for a WordPress blog, Permalink structure comes first in mind. Because permalinks play an important role to make your blog or website SEO friendly. Permalink structure or URL of your blog post help Search Engine bots to understand the keywords of your blog post. These keywords tell search engine bots about the potential topic of your article. Search Engines give high priority to the permalinks of a website for indexing web pages. So if your website’s Permalink Structure is SEO friendly, your chances to rank on Search Engine Result Page (SERP) are better. Now the next question might come in your mind is, which is the Best WordPress Permalink Structure for SEO I should use on my blog. 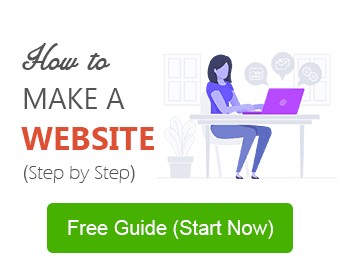 And how and when I should change my website’s Permalink? You might have read somewhere to add the category in permalinks, which is also a good practice and you can find many bloggers (including me – previously I was using the category and page_id, I have updated my permalink structure of my blog) are doing this way. But I personally recommend having a simple permalink with only blog post name. 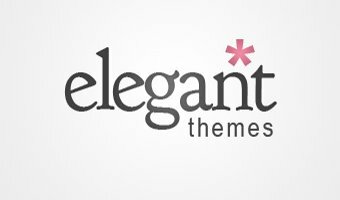 I opt only blog post name for my other blog TrulyBlogger. You should not use date or time in your permalink, why? Simply you cannot republish your post again. If you do so, it will show the same Permalink with old date or time. And visitors can easily see that this article is 3 years old. And believe me, in most of the cases visitors jump to another page because nobody is interested in a 3 years old article. There are a couple of customization options available for your to customize your Best WordPress Permalink Structure for SEO as per your website requirements and niche. Following Tags can be used to customize your WordPress Permalink Structure. %postname% – The title of the post. For example “What is SEO friendly Permalink?” becomes what-is-a-seo-friendly-permalink. Finalize tags for your Best SEO Friendly Permalink Structure in WordPress and Paste it into the custom field option available in WordPress Dashboard > Settings > Permalinks as shown below and hit Save Changes. Once you choose your Permalink structure, WordPress automatically generates your .htaccess file in the root directory. Did you know that You can Increase your web page Speed by Optimizing your Htaccess file? As I said earlier that Permalinks are the unique and permanent URLs of your blog post. You should select your SEO friendly Permalink Structure right before publishing your first blog post. In such cases, if you still have to change permalinks in WordPress. You need to make sure that you have setup a 301 redirection from old Permalink to new permalink. There are a couple of methods to change permalinks in WordPress without breaking links. You can use a simple code in your .htaccess file to setup a permanent 301 redirect from old URLs to a new one. – Generate your permanent 301 redirect code from Permalink Helper Tool by Yoast, click here. Various plugins are available in WordPress plugin depository for free to redirecting your permalinks from old to new. – I would recommend you to use Simple 301 Redirect plugin. Simply, download and install it. You just need to enter your old and new, tags or permalinks as per your requirement. – The second plugin could be a premium plugin. If you are using the Yoast Premium WordPress SEO Plugin, it will automatically redirect your old permalinks to the new one. Just install and activate the plugin before you change your permalink. You will get a simpler and relatively cleaner Permalink. Your Permalink would be SEO friendly. It will give a proper message to your visitors about a particular article. There are not as such any Cons of Changing Permalinks in WordPress. However, if you change permalinks in WordPress after publishing your post, it’ll affect your web pages indexing build by search engines. You may notice some downfall in search engine ranking, immediately, but don’t worry, the search engine page ranking will get covered in a couple of weeks. Hope you find this post informative, which Permalink Structure you find the Best SEO Friendly Permalink Structure in WordPress? Which structure are you using? Are you planning to change your permalinks structure? Do share your views, queries or new ideas in the comment section. Share this post with your friends for their feedback. I followed your advice about permalink structure. I hope these steps would be effective for site ranking. Thanks for sharing. Glad that you found the content useful. I appreciate your choice. nice explanation, Follow your Permalink structure Hope It SEo Friendly in Search engine. Glad that you found this post useful. Appreciate your words. Great, hope that work for my site. Glad that I could help. Looking forward to listen more on results from you. Glad that you liked it. Thanks for dropping by. Great. Even I also use the permalink structure as same as technumero. This is simple, sort and sweet as well as search engine friendly. Seems like your issue has been resolved. Google might take a couple of days to index your article in search results. However, if you did something to make it work, do let us know, I will update it in the post.